Adzuki beans (Vigna angularis), a member of the legume family, come in a range of colors but red adzuki beans are the most common. 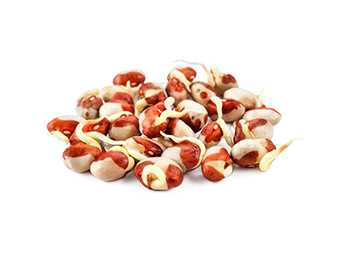 These nutty, mildly sweet beans are highly nutritious; low in fat and rich in high quality protein, fiber, complex carbohydrates and beneficial phytonutrients such as phenolic compounds and flavonoids, which exhibit strong antioxidant properties and support healthy cholesterol and blood glucose levels. Adzuki beans are also a rich source of folate and a high source of iron, manganese, phosphorus, magnesium and zinc, and the B vitamins pyridoxine, thiamin and pantothenic acid. Polysaccharides (complex carbohydrates) in adzuki beans provide long-lasting energy and have a low glycemic index. They help to reduce cholesterol and blood pressure, and to stabilize blood glucose levels. In addition, adzuki beans contain a high amount of resistant starch which passes through the small intestine undigested and is then fermented in the large intestine where it improves the composition of the intestinal microbiota.